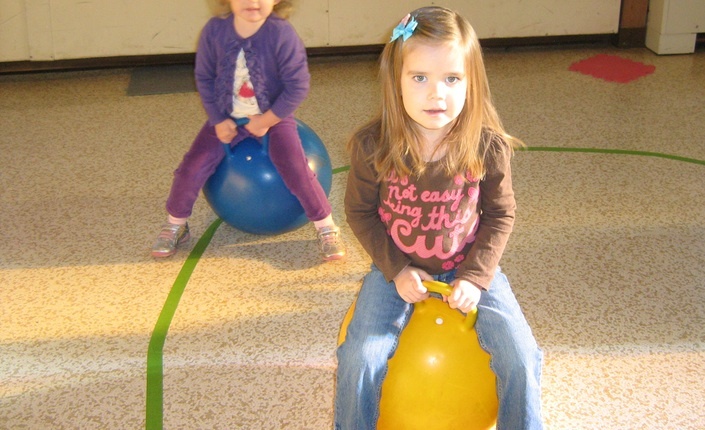 Twice a week the children have active time in the gym. Smiles are always easy to come by at Muppets. 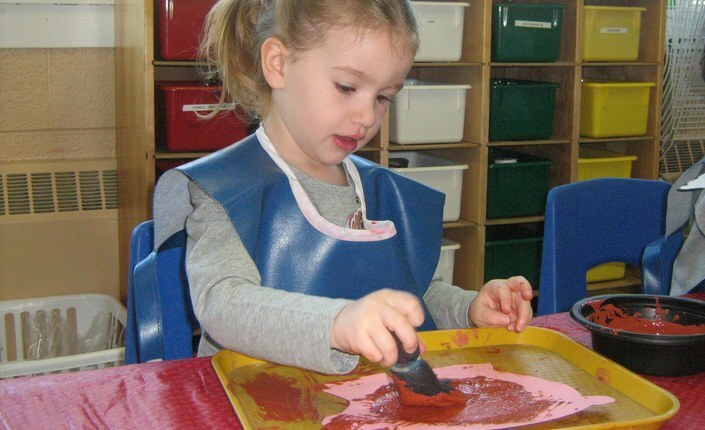 The children are given time to explore different art mediums. Throughout the year the "water table" might be filled with sand, rice, or snow. 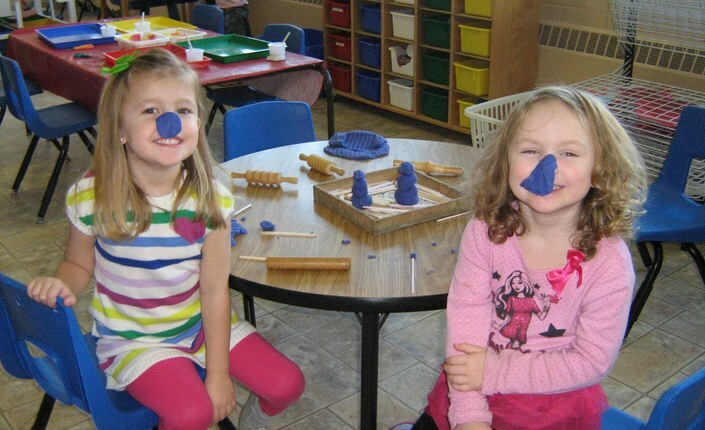 Muppets is proud to offer a warm, caring and safe environment where children develop through play based learning. Being a co-operative establishment, Muppets is organized and administered by the parents. 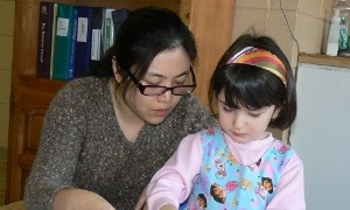 Under the direction of trained teachers, parents participate in the classroom creating a memorable experience for all. Looking for a social, fun introduction to school? Email or call us to set up a visit. 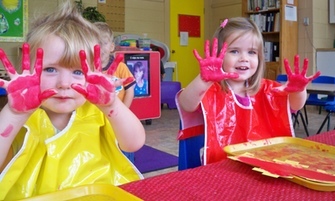 You and your preschooler can meet the teachers and see the spacious, bright classrooms! Accepting registrations now for the fall. It is first come, first serve to reserve one of only 24 spaces. Click on the Orange Program Button for more information regarding the additional day. Please specify on the registration form (first page) if interested in adding the Friday program to the 3 morning program. 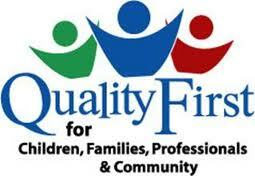 Click on the Blue Registration Button for more information regarding registration and the parent “Red Book” handbook. Please contact school for a tour or come stop by during program time. If you would like to support Muppets, here are some of our current fundraisers. All proceeds go to classroom improvement and new equipment. Thanks for your help! 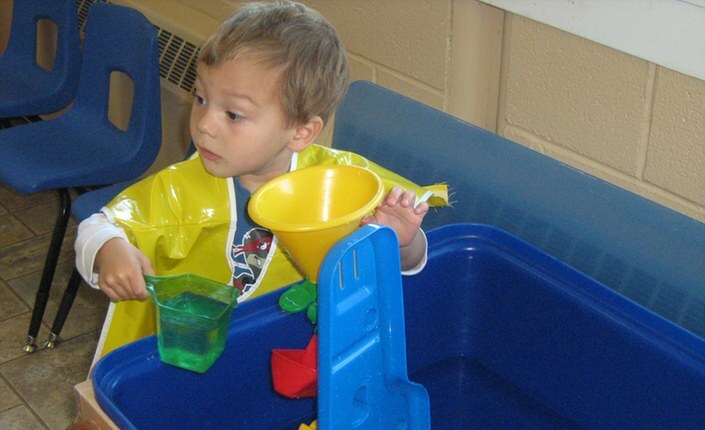 If you are looking to have hands on involvement in your child’s preschool experience, and become part of a friendly and vibrant community, then our program is what you are looking for. The children are encouraged to express their creative side with an organized craft table and many art supplies at their fingertips to produce their masterpieces. Entering our bright and colourful classrooms, you will soon realize you have entered a special place. Muppets incorporates teacher guided group activities and self-directed experiences throughout the classrooms. Our classrooms illuminate with smiles and enjoyment as the children experience the thoughtfully arranged toys, puzzles, book centre, water table, science exploration table, kitchen centre, dramatic play equipment and computer. © 2013 Muppets Co-operative Preschool. If you have not yet registered, you may do so here. Those details do not match our records. Registration for website members area. This is for use by the parents of children who are attending Muppets Preschool. Once your submit the form, your registration will need to be approved by our Registrar.